Fees associated with filing industrial design applications in Sweden as well as other design fees are available in the fee calculator. Multiple industrial design applications are possible in Sweden. The term for filing the industrial design application claiming priority in Sweden is six months from the date of priority. It is not possible to restore this term. - an indication of a product for which design is intended to apply. An industrial design in Sweden is valid for five years from the date of filing and may be further renewed for five years up to a maximum term of 25 years. Legalisation of a Power of Attorney is not required. It may be provided later, i.e. within one month from filing an industrial design application in Sweden. The certified copy of the priority document should be translated into Swedish and provided to the Patent Office before the date of registration. The information about the design application does not disprove its novelty if such disclosure is made by the designer or on behalf of a designer within 12 months before filing the application to the Swedish Patent Office. The first renewal fees are due starting from the 5th year from the date of filing. Foreigners should appoint an agent, a registered Swedish patent attorney to perform the industrial design prosecution in Sweden. The appearance of the whole or a part of a product resulting from the features of details of the product or details of the ornamentation of the product, particularly the lines, contours, colours, shapes, textures or materials may be registered as an industrial design in Sweden. It is not possible to register as an industrial design in Sweden which related only to the technical function of the product; which must necessarily be reproduced in their exact form and dimensions in order to permit the product in which the design is incorporated or to which it is applied to be mechanically connected to or placed in, around or against another product so that either product may perform its function. 1. 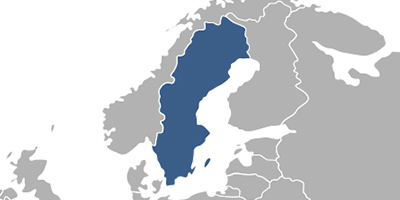 Online Search databases: Swedish Industrial Designs, Community Designs (EUIPO). 2. Industrial design protection in Sweden may also be obtained via registration of the Community Design.